Generally speaking the scaffolding market place is divided in to two approaches to provide access and support to work activities. Firstly, what is widely known as Tube & Fittings and secondly System Scaffolds. Both applications are in wide use in the UK and both are aimed at servicing the same market. It is often stated T&F applications are a peculiar UK solution while in Europe it is perceived the market has more widely adopted the use of proprietary System Scaffolds. This may well be true, however, there has been a general industry trend over recent years in the UK to move towards System Scaffolds and a general reluctance of scaffolding companies to adopt them, although it is recognised there are regional differences. Largely they work along the same principles of utilising modular standard components which offer flexible arrangements with rapid assembly. The key to system scaffolds is they often have snap-together connections which can become load bearing by the insertion of a wedge or the hit of a hammer. One of the key advantages of these systems is the well documented rapid installation time due to large modular components which do not need to be tightened with nuts and bolts and can be erected by arguably lesser trained / qualified scaffolders. Due to the investment made in these systems, there is a huge catalogue of available bespoke components to overcome the most common access requirements, such as, moveable hop-up brackets, battens for decking, corner returns and variable bay lengths to mention but a few with the aim of providing total flexibility for the overall site geometry. In addition to standard façade access solutions there has also been a great deal of development in ancillary scaffolding applications such as, modular staircases, loading bays, protection fans, temporary roofing systems and beam applications. One of the greatest drawbacks for any scaffolding company is the capital investment in these systems and the re-alignment of staff cultural perceptions in their use. Many scaffolders in the UK do not hold system scaffolds in high regard, although this is more likely to be as a result of frustration with their use rather than the system itself. Often system scaffolds have been incorrectly designed for the project in hand or the variety of stock held by the company simply isn’t flexible enough to resolve encountered problems. Perhaps not surprisingly, a scaffold company might not make what could be significant investments in equipment if they only get used a couple of times? While the catalogue of available components can be very impressive with a widget or gadget to overcome every geometric encounter, it is often only the larger players who can realistically afford to invest and deploy them. Where small to medium companies have only made limited investment, this can often result in scaffolders finding their own solution to problems they encounter on site by reverting back to what they know – Tube and Fittings. In fact, it has been noted on some projects, as a consequence of deploying incomplete system scaffold stock flexibility, the installers have been handicapped to progress in the way costed and planned. Ultimately, they install so much additional T&F in order to make the System Scaffold compliant it may have been quicker and easier simply to have used T&F in the first instance. Advantageously system scaffolds such as Layher, are manufactured using the same external diameter as the 48.3mm dia tube used within T&F and hence is compatible with the typical fittings used, allowing T&F modifications when required. Figure one shows and example of a T+F modification to a system scaffold. It should equally be noted, when used in the correct application and priced against the correct job, system scaffold can provide huge programme and cost benefits the project. The scaffold contractors who get this right can leave their competitors behind! Getting it right is the key aspect to both approaches. Unless specified as a System or T&F solution it is often the experience of the Estimator who must choose which approach to adopt and this is where it can go wrong. As with all trades, Estimators come in all shapes and sizes although they are often non-technical. Being non-technical can be a benefit and a liability. Most Estimators have worked their way through the ranks and have often many years of hands-on experience of scaffolding erecting. They can often approach a project with enough experience to, on the whole, allow and price for the final engineered solution. Irrespective of which component solution they adopt, they are often measured on targets of securing contracts and often do this with little or no interaction with any technical support. Some organisation in a drive to get higher usage from certain stock lines may apply pressure to win contracts with, for example, System Scaffolds. When a black and white approach to estimating and measuring scaffold area installations is adopted, System Scaffolds are always likely to come out cheaper and quicker when measured directly against T&F. However, clearly, if the wrong approach is adopted by the Estimator the scaffold company may find they have secured a contract at the wrong price. Unfortunately, many Estimators are not overly familiar with the lines they are pricing on a technical level, and it is these technical requirements of System Scaffolds over T&F that may cause the installation to simply be impracticable – or at best overly complex and modified to satisfy the technical requirements of the System Scaffold. It is however too late at this stage. Bearing capital outlay and availability of kit in mind, where system scaffolds are still growing in the UK, some of the less common brands attempting to break into the market do not have all the components stated in their product manual readily available. It is therefore essential that your designer has the product knowledge to design with components that are available. Suppliers can be checked in advance of design to check this and at IDH we recommend that these checks are undertaken if using a less popular system. Good product training and familiarity of both T&F, the System and available components you are holding in stock is the key to winning the right job at the right price. Unfortunately, it is common in many companies not to get technical advice at tender stage. It is common for companies to secure contracts and effectively make a commitment to which solution they are going to adopt before approaching designers for what is seen as the next phase in a scaffold project – get a design done. By this time designers have little influence over which solution can be adopted and their hands effectively become tied in that they have to make a square peg fit a round hole. No designer enjoys this scenario although most have been there. It is only a matter of time before the inevitable “Why have you got all this additional kit in there” discussion arises. Conversely, it is not uncommon for designers to look upon secured T&F schemes and automatically realise a system scaffold solution would have been a better solution. It is recommended early involvement of designers in the pricing phase can have a dramatic influence on stock utilisation and profitability. Unfortunately, many Clients are also completely unaware of the advantages and disadvantages of each scaffold solution and become cost led rather than best solution led. When presented with two differing quotes of dramatic cost difference but which appear to offer the same solution, it is only the very experienced Client who will ask the right questions. As most scaffolding contractors will point out, most Clients treat scaffolding packages as an inconvenient necessity to enable the important package they are really concentrating on – such as cladding. Scaffolding on any project should be treated and managed as a stand-alone package – equal to a permanent installation package. Furthermore, it is good practice for the Scaffold Package Manager to instigate early engagement of the scaffold contractor and insist on the early involvement of the Scaffold Designer. If the Client has any hope of the scaffold package coming in on budget and avoiding a raft of unforeseen variations they must ensure all scaffold designs are also reviewed and accepted by those who are to use the installation. Only the Glazer, Bricklayer, Stone Cladder know exactly what offsets and lift levels would best suit their works so they should be reviewing the scaffold design and commenting on changes and requirements. If they choose not to then later request an adaption, the liability for payment becomes clearer. It is not uncommon practice for less than scrupulous scaffold contractors to price what is requested in the specification at a low rate if they believe the Client is not on top of the package and there would be an opportunity to recover costs and additional profit through adaptions and variations that could have been avoided had it been planned – adaptions and variations which are only too recognisable to a scaffold contractor who undertakes these structures on a weekly basis. The following table identifies circumstances where one approach may be more advantageous over the other. New Build Concrete / Steel Frame Projects where façade access is required for cladding activities. Often the floor crs & column grids will not correspond with the modular nature of system scaffolds resulting in nodes requiring ties to be out of position from a suitable anchor point. This can result in substantial modifications such as plan bracing, ledger bracing, additional ties or v-tying in either or both Hz and Vl directions. It is quite common for only 1 in 4 lifts to correspond with typical floor centre construction as these are seldom 2 or 2.5m which is a common modular height of most system scaffolds. Large areas of existing façade which is deemed suitable for anchors suits both solutions as ties can be installed where required with few modifications. In this scenario System Scaffolds are likely to return greater productivity rates. Facades where few Ties can be installed. System Scaffolds sometimes have a requirement for more tie frequency than T&F scaffolds and this lack of available fixings positions can result in large scale additional bracing such as buttressing, raker supports, ledger and plan bracing. Depends on the extent of plan bracing and the site requirements. Often System Scaffolds are constructed in 2m lifts resulting in the plan brace (and tie tube) interfering with the headroom. T&F scaffolds can be erected with slightly larger lifts to maintain access (although this must then become a designed scaffold as it is no longer compliant with TG20). Some system scaffolds such as Layher have improved int this area. Design of the steel decks together with a member that secures them into the transom creates a plan braced bay. An additional plan bracing tube under the deck would there for only be required in extreme cases. One of the primary benefits of most system scaffolds is that they have been designed sufficiently stiff to avoid the need for ledger bracing in normal use, resulting in all lifts remaining clear for access. While T&F can be erected to TG20 as partly ledger braced with a maximum of 2 adjacent non-ledger braced lifts, often this arrangement quickly becomes redundant requiring reinstatement and modification at other levels resulting in possible additional scaffold costs if not foreseen and a lack of work programme flexibility where multiple trades cannot operate on multiple lifts concurrently. Generally with a requirement for lifts to be erected progressively with the brickwork in 1.5m intervals. For T&F scaffolds this requires either attendance or multiple visits for the scaffold contractor as each lift is only constructed on completion of the 1.5m brickwork element. Where ties are installed to the brickwork these can also be installed progressively. When the scaffold is subsequently to be used by another trade it requires major adaption as all lifts are still installed at 1.5m intervals, which makes it unusable. 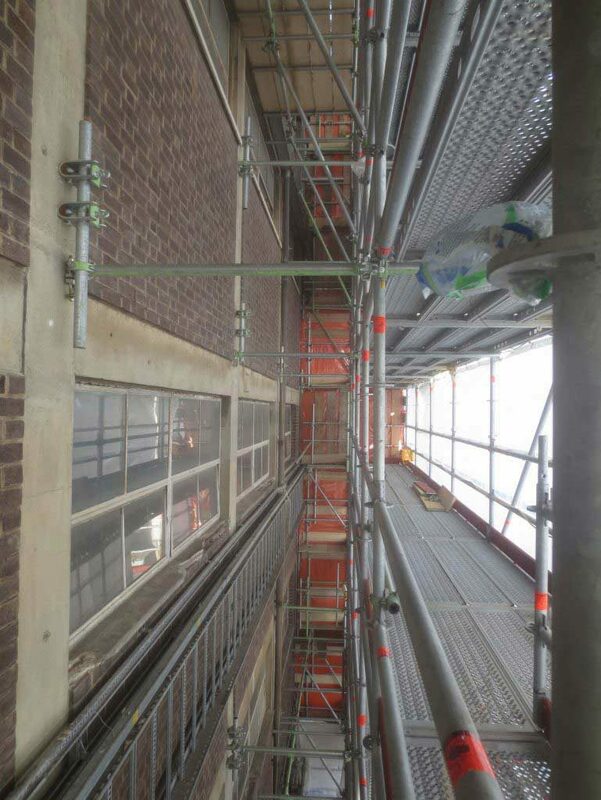 System scaffolds incorporate moveable hop-up brackets which give greater flexibility allowing the scaffold to be erected in advance in 2m lifts and the brackets moved to suit the bricklayer’s progress. The main scaffold will need access to the structure for tying and these subsequently may hinder the brickwork requiring co-ordinated removal although subsequent large-scale modifications can be avoided. Due to their modular nature, as long as the original grid is maintained, adaptions to System Scaffolds can be fast and effective. T&F with its inherently longer tubes, alternately spliced connections and numerous hand-tightened fittings can be slow and labour intensive to adapt. Where components are to be ‘cut out’ T&F is clearly cheaper with the off-cuts re-sized and returned to stock. Cutting system components should always be frowned upon as the integrity of the entire component is often compromised and lost to stock. System Scaffolds incorporate flexible inside board bracket arrangements such as 1, 2 or 3 board or 3 (comprising a 2+1 board for instance) allowing the entire removal and subsequent reinstatement with a smaller module if required or just the removal of the outside element. This flexibility is ideal for cladding and glazing operations. T&F on the whole is less flexible as all the transoms on a lift would need to be removed and reset (including the boards to enable this). Although T&F is also becoming ‘modularised’ and there are now products on the market such as T&F hop up brackets and telescopic transoms with a retractable inner. Facades stepping in & out frequently along their length. It is a requirement for most scaffolds to have a close ‘hugging’ fit to the façade they are addressing to reduce the likelihood of falling objects or personnel through large gaps. Where these gaps exist, it is a requirement to install additional handrailing and toeboards. Due to the modular nature of System Scaffolds it is often the case they do not ‘fit’ as well as T&F which can be based out to exactly follow the profile of the building whereas System Scaffolds often require T&F bays to close neatly or infill areas where gaps exist. Facades stepping in & out in their height. Both types of scaffold deal reasonably well with stepping vertical facades. Where cornices exist, it is common practice to jack to the underside and base out again on top of it. Both solutions cope reasonably well with this although T&F does have the advantage of a more flexible transom width if the continuation of the standard is no longer required in line with the lower section. System Scaffold stairs are very quick to assemble and can go great heights. When used in conjunction with a T&F scaffold a common problem is creep or non-alignment of the landing and scaffold lift level. T&F stairs are time consuming although can be bespoke in width and height. System Scaffold loading towers are very quick to assemble and can also go great heights. When used in conjunction with a T&F scaffold a common problem is creep or non-alignment of the deck and scaffold lift level. T&F loading platforms can have many legs when beams are not incorporated and may require check or supplementary fittings, especially in progressive loading bay applications. System Scaffolds have made huge advances in the area of temporary roofs and it is recommended these are always adopted over traditional Corrugated Iron roofs. While the capital outlay may be prohibitive, many of the components can be used in other applications when not required as a roof, the programme advantages are drastic and the H&S benefit of avoiding clambering over the beams to install lacing tubes and sheeting in itself is a worthy reason why these should always be adopted over traditional measures. Both approaches can be equally beneficial. Where space permits, productivity of System Scaffold erection wins over T&F. Where very narrow dolly towers are required it is often the flexibility of T&F that makes it more advantageous in gantry applications. Birdcage construction in modular System Scaffold will offer programme savings when the grid suits. Although some system scaffolds always protrude through at deck level due to the exposed length of standard above the top node position creating a trip hazard. Most System Scaffold have assemblies to resolve this but it is unlikely to be held in stock at most firms. T&F standards can always be terminated flush with the transom level providing a continuous flat deck. Cut standards are then cut back further following use, to reconvert them into a stocked size. System scaffolds typically manufacturer a locking element for use at joints in standards when used in tension. Tube and fitting scaffolding relies on splicing standards with an array of supplementary couplers. For larger suspended T&F scaffolds bespoke connectors are available which increase the tension capacity at the joints. For smaller more typical height suspended scaffolds, system scaffold will have less components required and will be erected in a shorter time period. In terms of health and safety, system scaffolds are very much advantageous. Tube and fitting scaffolds have multiple couplers and fittings required to secure tubes and boards in the anticipated arrangement. 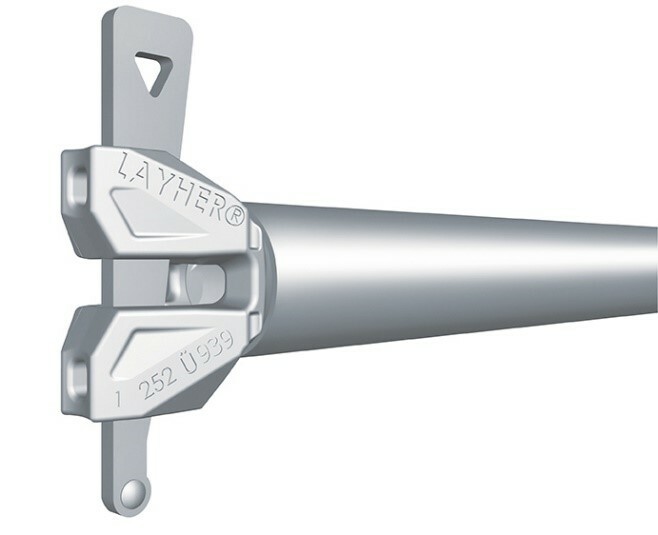 System scaffolds however are designed and manufactured with inbuilt connections, (for example the Layher wedge shown in Figure 2) omitting the need for of several loose fittings. In the case of figure 2, the end of a ledger or transom sits above and below a rosette (welded to standards at 500mm centres or clamped on to secure tubes and levels between the 500mm centres). The wedge is driven through with a hammer to secure in place. Note the wedge cannot become separated from the tube, and hence there is only one element for a scaffolder to keep hold of prior to it being fixed in place. Loose fittings not required for fixing. Standard, ledger and transom joined with 1 No fitting. Improved erection time and health and safety aspect. Spacing of ledgers is fixed, allowing basing out in a shorter time frame. Joints provide an increased frame stiffness, that can allow ledger bracing to be omitted in several cases. This provides a clear unobstructed working platform, as would be expected in a system scaffold. Extendable (sometimes known as telescopic) transoms are also on the market. For applications where the scaffold is required to be adapted at a certain stage of a project (for example, to facilitate brickwork install following inside boards set out to the frame) these are very beneficial. Inbuilt connections to the ledger – no loose fittings. Speed of adaption. In traditional scaffolds, the single couplers (fixing transoms to ledgers) are loosened allowing the transom to be slid back. With extendable transoms, the inside board is lifted, and the extending section of the transom is slid back in to the required position. The connection between the transom and ledger does not need adjusting. The tying of a scaffold is typically a time-consuming part of the erection process. System scaffolds generally require a greater number of ties over a given area to achieve a similar standard axial load capacity for a tube and fitting standard, when erected to similar lift and bay dimensions. Ledger braced tube and fitting scaffolds tied as per the available tie patterns within TG20:13 generally provide higher standard axial capacities with a smaller number of ties to area ratio. The successful addition of modular components into tube and fitting scaffolding backs up the advantages of using system scaffolds in the right situation. In terms of speed of erection and health and safety, they can be levels above tube and fitting scaffolds. Tube and fitting scaffolds are less restricted in terms of levels and sizes and can be used in non-uniform situations where a system scaffold would not be viable. It is advantageous to for the scaffold contractor to consult with an experienced scaffolding designer at tender stage, to get a technical view on whether the proposed works are more suited to a T+F or a system scaffold. As this text has discussed, different types of scaffold solution can suit different types of equipment. Understanding the type of scaffold that is best suited can have a large positive effect on profitability.